Intentional seems to be a buzz word around the blogosphere these days. “Live life on purpose,” is the mantra to be heard. I can be heard chanting the mantra along with everyone else, but in the back of my head, I wonder, can you be too intentional? Live life on purpose…too much? Being intentional, along with almost every other characteristic, has a dark side. It’s when a good characteristic goes too far that it has the potential to rot. Like that piece of fruit that becomes it’s sweetest right before it decays. I question zealous intentional living, not looking at any particular person, but myself. I have organized binders, full of pinterest printables; scheduling my goals, meals, events, and pretty much anything I can think of. I’m a huge believer in the power of planning and goal setting. But the truth is that clinging to the perfect lives those printables promise us can actually rob us of what’s worth living for; people, relationships, and community. I am among the most guilty on this accord. There are signs I’ve noticed in my own life (and maybe you can relate) that my priorities have become askew and my pretty printable life is commanding me rather than serving me. I’d like to think we’ve all had that day, when everything is going as we planned (or time-blocked) and an unexpected problem arises. Not our problem, but someone else’s. A friend, spouse, child or complete stranger hits a wall and our heart is tugged in their direction. I’m ashamed to say that sometimes in this situation, my desire to stick to my pretty plans has triumphed over the tugging of my heart. I finished the day perfectly on routine and I felt…remorse. The thing I had been serving, in hopes of receiving satisfaction, had in fact robbed me of a worthwhile opportunity to aid another soul. I believe the key to having balance is knowing your priorities and making sure your plans serve them, rather than you serving the plans. A lot of life’s sweetest and most memorable moments happen when we follow the tugging of our hearts and are willing to be joyfully inconvenienced for another. It comes back to your priorities. Do you exist more in living out your priorities or in planning for them? Ideally you only spend 5%(ish) of your efforts on planning and the rest in executing. Don’t allow your plans to rule you and demand your time. An intentional life filled with goals and plans written in pencil is to serve as your tool, not your master. I’ve often found myself in the position of filling out organizational sheets with an idolatrous mentality. That these plans will get my life together and make it worthwhile. It’s easier to plan then to live in the unpredictable mess of life. I prayerfully search for that middle ground where I am responsibly productive and flexibly present. I am great at productive procrastination (which is kind of not so great). I can over plan in the name of perfection. The name of responsibility. The name of, “This is my one shot!” But in the end, these are all masks I give to fear. Fear that manifests itself by being an idolatrous kind of controlling. “It’s up to me. I have to make this perfect.” It’s so easy to forget that He’s sovereign, and I’m not. Make your plans, give it to God, and do it scared. I think we should absolutely live our lives intentionally. Planning and goal setting is wonderful and arguably necessary, but I believe plans are best made in pencil and given to God. When your plans are serving your purpose (rather than you serving your plans), it leaves you free to be joyfully inconvenienced, exist in the executing and not be afraid of imperfect results. Love this!!! I’m a planner too, but have learned that trying to plan everything leaves very little opportunity to just be. 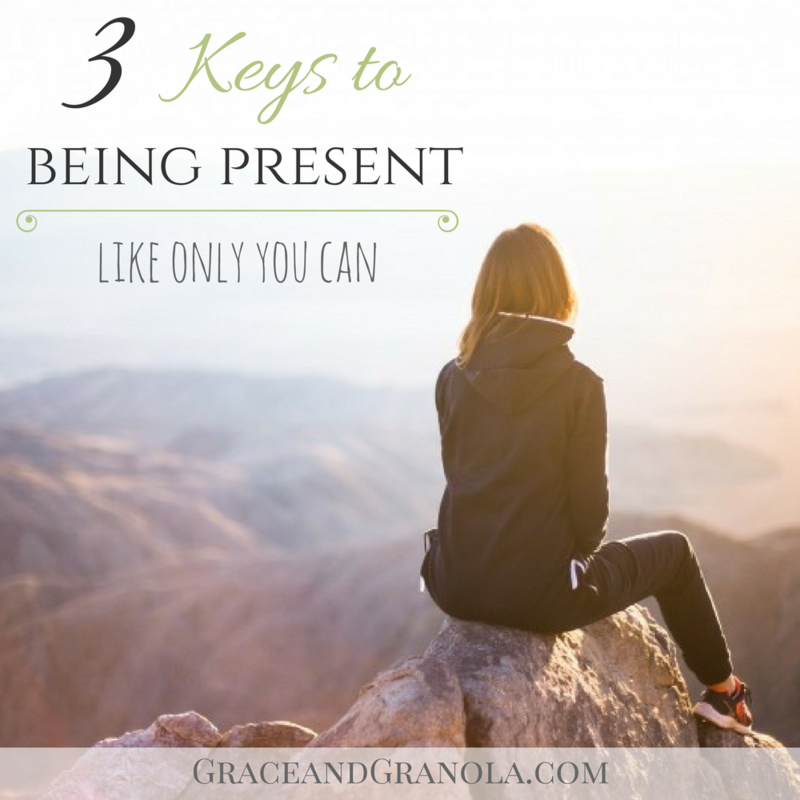 To be either in the moment or be present because you are too focused on your plan. I am all about being intentional, but I’ve learned that the best-laid plans are subject to change. Especially when we submit those plans to God because His ways are not our ways. And when you said,”When your plans are serving your purpose (rather than you serving your plans), it leaves you free to be joyfully inconvenienced, exist in the executing and not be afraid of imperfect results.” all I could say is AMEN! I’m a stay at home mom and sometimes I am “unwilling to be inconvenienced.” I have our plan set for the day and I want to stick to my plan! I’m working on learning to go with the flow a little more. 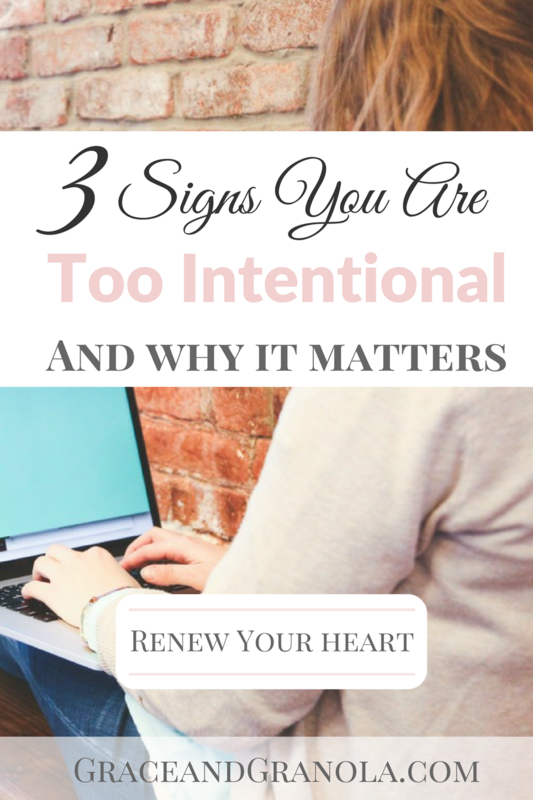 Really great thoughts in regards to being too intentional! Never thought of it this way. Thanks! Great points here, as I also hear the word intentional a lot. And, I’m a planner who has a hard time with imperfection and spontaneity. Oh, man, is this post ever on point! You’re so right – intentionality is great… but only when things go your way. But if you’ve planned every detail and life gets in the way (as it always does)? We fall apart! This gives me some serious food for thought – thank you for sharing your insights! This is a great post! I think I often get stuck in the planning stage and never get around to the doing stage as much as I want to. Definitely something I want to work on! I love this! Subscribed. I am totally guilty of getting caught in the fear of imperfection. Wow this was really helpful. Thanks for your insight. Perfectionism can definitely be a liability. I’ve had to work hard to embrace the idea of a “minimum viable product”: being willing to take what you have, put it out there, and refine as you go. Interesting read! I too am guilty of being scared of being imperfect! This was such an interesting read! I’ve never though about being too intentional, but I definitely think I’ve gone down this road before. I am certainly afraid of imperfection, which is something I’ve been working on. A lot of the time I get stuck in the planning phase which is definitely no good. Such a great post!